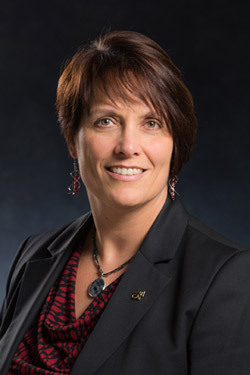 University of New Brunswick President Eddy Campbell is pleased to announce that Karen Cunningham has been appointed Vice-President (Administration and Finance) at the university. Cunningham, an accountant who has served in a number of progressive leadership roles in the public sector, first joined UNB more than three years ago as university comptroller. Last September, she stepped into the vice-president’s role on an acting basis after long-time vice-president Dan Murray retired. Her appointment this month comes after a comprehensive search for candidates led by a bi-campus committee comprised of a cross-section of the UNB community. Prior to joining UNB in 2012, Cunningham held a series of successful and progressive leadership roles with the New Brunswick government. After completing her Bachelor of Commerce degree from Mount Allison University, she earned her chartered accountant designation through the New Brunswick Institute of Chartered Accountants while articling with Doane Raymond (now Grant Thornton) in Fredericton. She is a member of the Chartered Professional Accountants of New Brunswick, the UNB Masters Swim Club, and the Fredericton chapter of the Financial Management Institute. She has also served on the board of the Capital City Skating Club since its inception. For more information or interviews, please contact: Sonya Gilks, UNB Communications, 506-453-4546.